What would food be without the spices??! Of course the natural flavor of the foods we eat are incredible, but I find so much joy and pleasure in finding spices to compliment the natural flavors in the dishes I’m making. From dukkahs to dressings, I’m always finding ways to incorporate new spices. I love buying my spices in bulk from Mountain Rose Herbs. I value MRH’s commitment to sustainability and the highest quality of sourcing. It’s so important that we support brands that are dedicated to the most sustainable sourcing practices as with the age of Amazon the quality and means of sourcing can be easily jeopardized. MRH has so many different herbs and spices to choose from, and you can purchase them in a variety of quantities. I use a funnel to transfer them into recycled glass bottles and jars to store in my spice cabinet. As a general rule of thumb, ground spices last about a year while whole spices can last 2-3 years. To extend the life of your spices, store them in a cool, dark place away from direct sunlight. 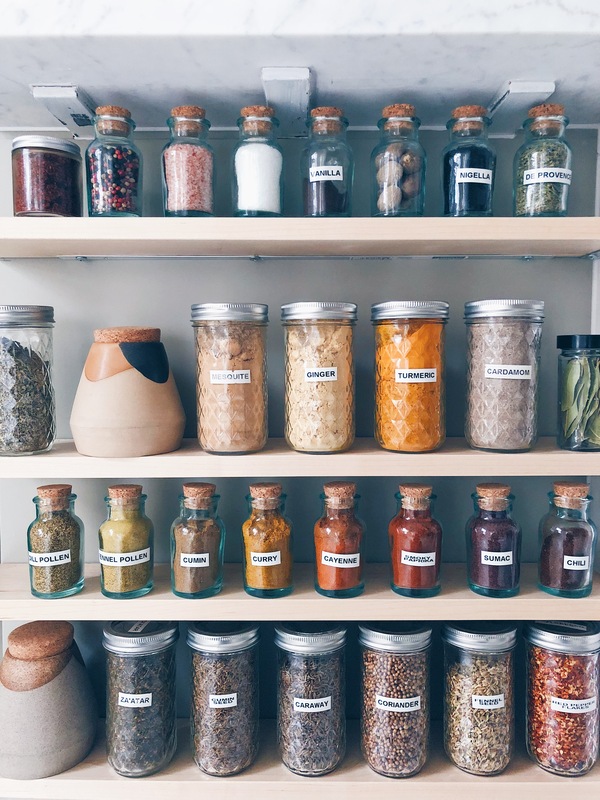 If you want to keep track of when you purchased your bulk herbs and spices, just write the date you purchased or received them on a piece of masking tape and stick it on your bulk bags and/or bottles/jars. You can also usually tell if a spice has gone bad if the color and/or the aroma is faded or dull. 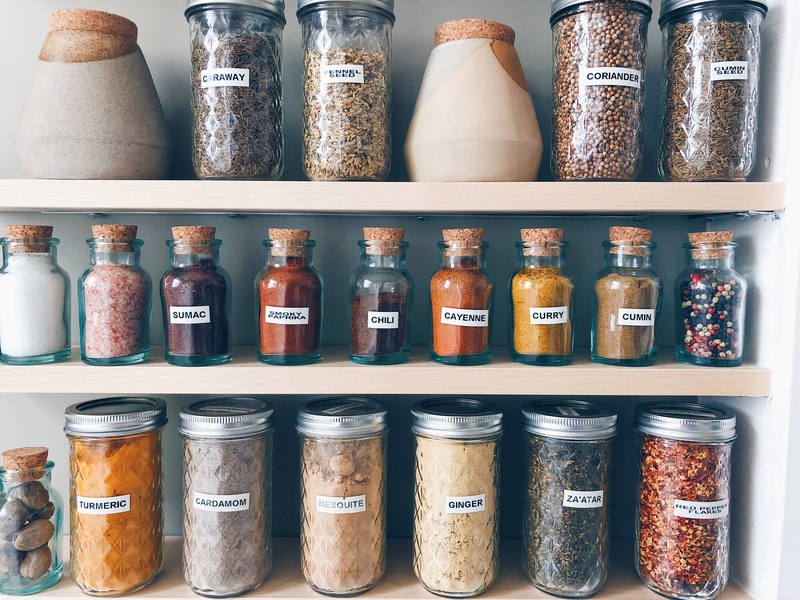 In this post, I’ll go through the most commonly used spices and herbs in my spice cabinet. These are by no means the only spices and herbs I use, but the ones I use on a daily and weekly basis. Here’s one of my favorite dressings using dill OR fennel pollen. Super simple recipe that packs a ton of flavor. Salt – I keep a variety of salts on hand. My favorites are Himalayan pink salt, sea salt, smoked sea salt and black lava salt. Peppercorns – I seriously loooooove pepper. I grind it fresh on most of my meals. I love the richness and depth that a mix of black, white and pink peppercorns offers. Turmeric – Turmeric should be mandatory in every person’s spice cabinet. I love that it can be used in sweet and savory preparations. I’d have to say my Golden Chip Bliss Balls top my list. Cardamom – I love adding a hint of cardamom to my potions and elixirs, and of course my Walnut-Cardamom Bliss Balls are a crowd favorite. Ceylon (Sweet or True) Cinnamon – I use this one everyday in my matcha, but cinnamon has so many uses. This warming spice is packed with antioxidants and is recognized for its anti-inflammatory properties and ability to help stabilize blood sugar levels. Ginger – I love using ginger powder in moon milks and bliss balls. The fresh stuff is still my favorite, but I always keep the dry stuff on hand. Mesquite – A great low-glycemic natural sweetener, mesquite powder has a mild, slightly sweet and nutty flavor with hints of caramel and molasses. I often use mesquite in my matcha and moon milks. Vanilla Bean Powder//Vanilla Beans – These are a bit pricey, but for me they are worth it. I prefer to use these over vanilla extract, but the extract is a great more affordable option. Nutmeg – I don’t use this one that often, but when I do, I always use my microplaner to grate it myself. Like pepper, nutmeg just tastes better when it’s freshly grated. Herbs de Provence – Such a lovely blend. I love adding these to tomato sauce and pizza dough. Also lovely on roasted chicken and fish. Bay Leaves – Great for enhancing the flavor of any broth, soup, stew or sauce. Fennel and/or Dill Pollen -Highly aromatic and alive with freshness, both dill and fennel pollen are great additions to a spice cabinet. I love using them to infuse dressings with flavor. You can also just sprinkle them over your favorite salad or meal. Caraway Seeds – My favorite way to use these is in dukkah as well as in sautéed purple cabbage. I also love making caraway pickled carrots. Fennel Seeds – So fragrant when toasted and used in dukkah. Also love using this seed in tomato sauce and in homemade chai tea blends. Coriander Seeds – Another dukkah ingredient, these guys pack a serious flavor punch. Also great to use in pickling brines. 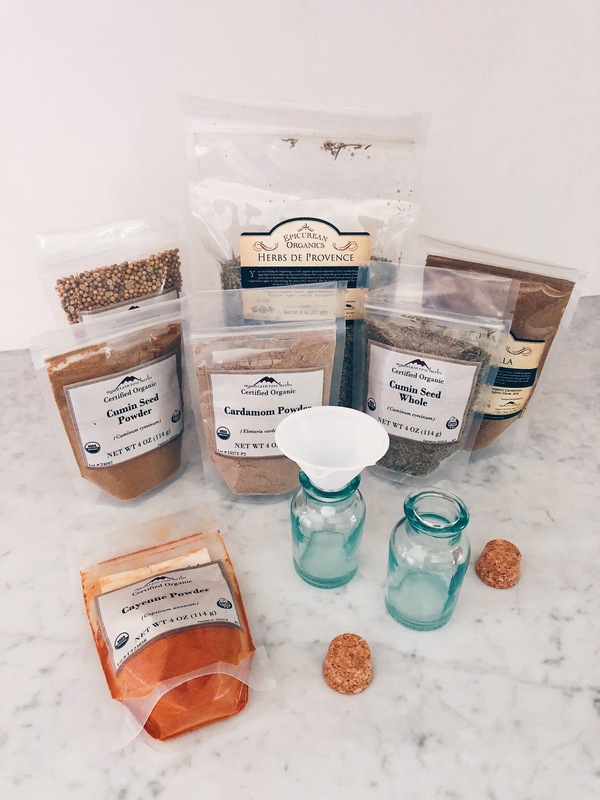 Cumin Seed and Powder – I love making cumin seed oil and using them toasted in dukkah. The powder is great in so many dishes. Just used in in my shakshuka from this past weekend. Nigella Seeds – Tiny black seeds that I love to toast and sprinkle over my finished dishes or use in dukkah. They taste slightly bitter and resemble cumin or oregano with hints of toasted onion. Sumac – This one I just started using last year, and I love it. It has a bright, tart and almost sour flavor. I add it to dukkahs and dressings. Smoky Paprika – I love the deep smoky flavor this spice imparts. Urfa Biber – A dried Turkish chili pepper with a sweet-smoky-sour flavor. I love using it as a finishing pepper. Chili Powder – My favorite popcorn topping with nutritional yeast, vegan butter and salt. Yum! Cayenne – This spice brings the heat! A little goes a long way. I love adding a sprinkle to soups and curries. Curry Powder -Curry is a staple dish in our haus. In the winter, I make it once a week. Curry powder is also a great popcorn topping! Red Pepper Flakes – I use this for Italian-inspired dishes. One of my favorite pastas is just olive oil, sautéed garlic, lemon juice, salt and red pepper flakes. Za’atar – This is one of my favorite spice blends. I love using it to top roasted veggies and chickpeas, and it makes a great addition to socca batter. 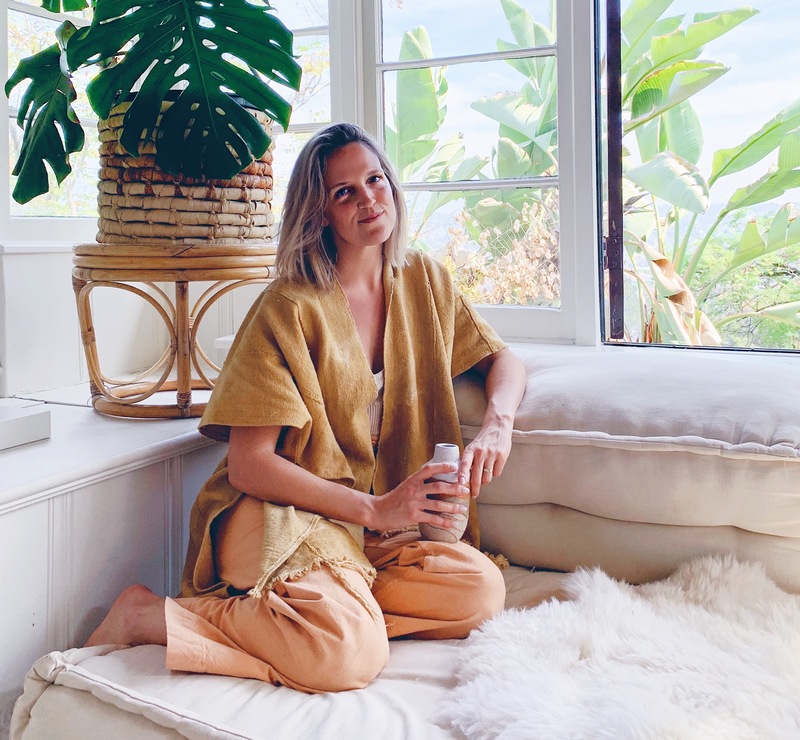 Winter Self-Care, Herbal Chai + A Giveaway!